Welcome to this learning resource on animal welfare-friendly pig housing systems. The way we produce pigs for pork consumption is of great concern. Animal welfare legislation and the means of enforcing it are becoming clearer and more powerful. This learning resource is based on an inventory of 108 pork production systems in the EU and competing countries and a survey on consumer attitudes to pork production that was conducted in 2008. It includes examples from six different production systems in two countries, France and Sweden. The systems are described from economic, technical and animal welfare perspectives. It has a strong focus on video clips from different pig production systems. 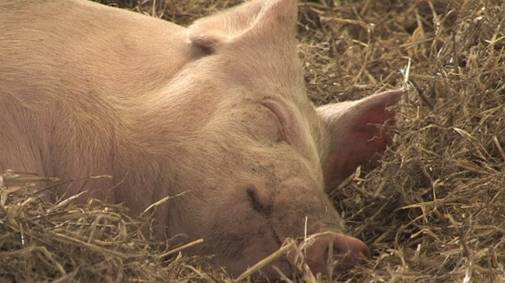 The first video about pigs in a semi-natural environment includes clips showing pig behaviour in semi-natural conditions and in different commercial systems in Sweden, the UK and Denmark. Interviews with researchers, politicians and farmers are also included. This video is about 20 minutes long. After this introduction the learning resource is divided into sections according to the production stage of the pig. For each production stage a number of different commercial pig production systems are presented - conventional systems and systems with a focus on animal welfare-friendly pig housing. Every system is presented with video clips and production figures. By exploring the material you will learn more about the mechanisms behind the different behaviours of the pig and what should be taken into account when building housing systems. The scientific reports on the animal welfare aspects of different housing and husbandry systems are peer-reviewed by the members of the Scientific Panel for Animal Health and Welfare (AHAW) for the European Food Safety Authority (EFSA). The report on adult breeding boars, pregnant and farrowing sows, and unweaned piglets was adopted in 2007 and the report on weaners and rearing pigs was adopted in 2005.